And I'm Renee Montagne. Today in Your Health, one man's quest to protect his son. The New England Journal of Medicine reports that his experimental device, a bionic pancreas to automatically control blood sugar for people with Type 1 diabetes, appears to be working. NPR's Rob Stein has the story. 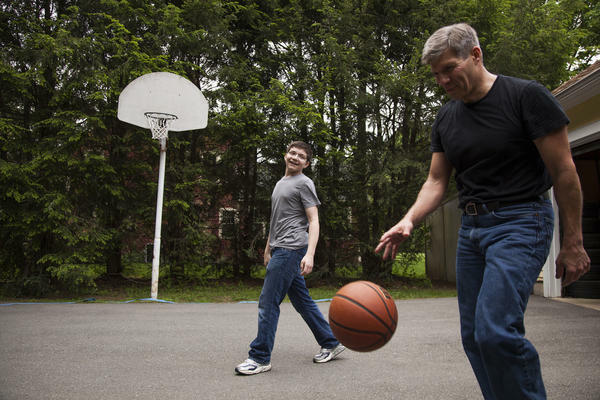 ROB STEIN, BYLINE: When I started working on this story, I knew life could be hard for people with diabetes. But I didn't really get how hard until Ed Damiano invited me into his home. Ed lives on a quiet cul-de-sac in a pretty little town outside Boston. It's the middle of the night. I'm camped out in his living room. Ed and his family are all asleep upstairs. An alarm goes off on Ed's nightstand. He jumps out of bed and I run upstairs. Ed's son, David, is asleep in the room next door. STEIN: So what just happened? ED DAMIANO: So David's alarm went off. STEIN: David has Type 1 diabetes, so he sleeps hooked up to a monitor that goes off when his blood sugar gets too low. E. DAMIANO: It suggests that he's very, very low. STEIN: Why are you worried about that. What's the danger? E. DAMIANO: So the danger there is that there's a syndrome called dead-in-bed syndrome. STEIN: Dead-in-bed syndrome. Some diabetics go to sleep and just never wake up. It's rare, but it does happen. E. DAMIANO: The fear is that there's going to be this little cold limb and I screwed up. And that's quite a screw-up. You know, I mean, that' - it's all on me. STEIN: OK so you're going to go into his room right now? STEIN: We tiptoe into his son's room. David, he's 15. He's sprawled out on the bed. His father reaches for his hand. David's warm. He's OK. We slip out of the room. David's still sleeping. E. DAMIANO: That's the moment of relief, right? STEIN: Ed Damiano's been doing this night after night, sometimes several times a night since David was diagnosed 14 years ago. STEIN: You do this every night? E. DAMIANO: It became a new routine of my life 14 years ago - my new normal. STEIN: But Ed knows he can't keep this up forever. In just a few years, David's going off to college. What then? So Ed, who is a biomedical engineer, decided to invent something to watch over his son - something he calls a bionic pancreas. TOBY DAMIANO: David? Are you awake? You are. STEIN: The next morning, Ed and his wife, Toby, seem like any other parents rushing to get their kids, David and his sister Emily, off to school. STEIN: After they're gone, they explain how all this started. T. DAMIANO: So Davey was 11 months old. He was starting to walk. He was pushing a push wagon. And then he stopped doing it. STEIN: He stopped trying to walk, stopped eating, got weaker and weaker. Toby took her son to the doctor. Turned out, his pancreas didn't make insulin so the sugar in his blood was poisoning his body. She realized he was facing a long list of terrible complications later in life - blindness, amputations, heart attacks. She rushed him to the hospital. T. DAMIANO: I crawled into that hospital crib with my son and I held him. And he got stuck and pricked and, you know, I knew how much work we were going to have to do to keep him safe and I knew the consequences of not doing a good job. STEIN: Toby's a pediatrician. She and Ed made themselves into experts about diabetes. And Ed became a 24/7 walking blood sugar monitor. E. DAMIANO: It's now 1:20 a.m.
STEIN: Even pricking David's finger in his sleep to test him, giving him insulin when his blood sugar's too high and getting him to sip juice without waking up when he's too low. E. DAMIANO: David is sleeping soundly. STEIN: But even Ed, watching him so closely, couldn't become a human pancreas. E. DAMIANO: It's intimidating when you start considering the list of things that influences blood sugar - I mean, emotions and physical activity, if you're healthy, if you're under the weather. You can't possibly take into account and balance all those things. And you sometimes get it right and you often get it wrong. STEIN: Ed became convinced there must be a better way and that he could find it. So he essentially switched careers from writing esoteric papers about mathematics to developing a bionic pancreas at Boston University. E. DAMIANO: A bionic pancreas is a device that automatically takes care of your blood sugars 24/7. It's a device that basically comes to know you. And it's the next best thing to a cure. STEIN: That's a pretty bold statement. But Ed's clearly a confident guy and he tells me he doesn't let doubts get in his way. There's lots of other people out there working on something like this, but his gizmo is one of the most advanced. At the moment, it's basically a really, really smart app. E. DAMIANO: The current incarnation of our system runs on an iPhone and that iPhone is connected to a continuous blood sugar monitor. 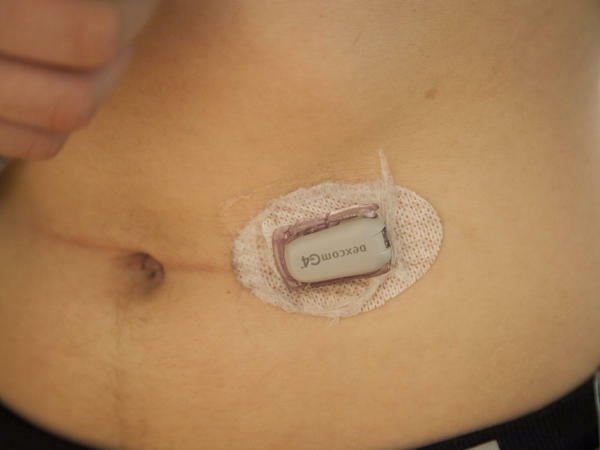 STEIN: A monitor that some diabetics already wear taped to their bellies. They look kind of like a small pager. STEIN: Which lowers blood sugar. E. DAMIANO: ...And one filled with glucagon. STEIN: Glucagon - another hormone which raises blood sugar. For the person using the app, it constantly crunches the numbers from the monitor to tell the pumps how much insulin or glucagon to infuse through tiny tubes inserted under their skin. E. DAMIANO: It's life-transformative, not having to think about their diabetes anymore. OK, it's a total game-changer. STEIN: And it looks like it's working. In the New England Journal of Medicine, Ed and his colleagues reported his bionic pancreas did great on 52 teens and adults. And Ed's got the go-ahead to let volunteers use it on their own for the first time. STEIN: Ed's clearly psyched when he meets his volunteers at the Massachusetts General Hospital in downtown Boston. E. DAMIANO: It's fun to just be in the, you know, in the heat of the moment. (Laughing). STEIN: His team's getting ready to hook up the volunteers. ARIANA KOSTER: I'm Ariana. I am 23 years old. STEIN: Ariana Koster's been struggling with diabetes since she was 11. She can't wait. KOSTER: It's very, very exciting. This thing is going to take the worries about my blood sugar off my hands for a few days. STEIN: Ed's team explains how the bionic pancreas works, helps Ariana set it all up. KOSTER: All right, insulin is loaded. STEIN: ...To the moment when they'll switch on her bionic pancreas. E. DAMIANO: You guys are bionic. KOSTER: I'm a bionic woman. STEIN: Back at Ed's house that night, he's watching his volunteers' sugar in real time on his iPad mini. He pulls up Ariana's numbers. E. DAMIANO: There it is. STEIN: The bionic pancreas is literally making life-and-death decisions for her. E. DAMIANO: Oh it's amazing, right? I'm blown away by these numbers. I'm so reassured by these numbers. STEIN: But things didn't go as well for his son David that day. He doesn't have the bionic pancreas yet. E. DAMIANO: You went to class with your pump, where? In the locker room? DAVID DAMIANO: In my backpack. E. DAMIANO: You forgot to connect it? D. DAMIANO: Yes. You want to record this? E. DAMIANO: Yes, I definitely want to record that. The teenage brain. STEIN: They're laughing, but this is just the kind of thing that terrifies Ed and Toby. It won't be long before David goes off to college and Ed's not there to make sure he's okay. E. DAMIANO: I mean, we could just get a phone call from the dean of students one day. T. DAMIANO: Your son is dead. He's in his room. We don't know anything. OK? And I know what happened. He overdosed on insulin by accident. I raised this precious person for 20 years and he died for some stupid mistake. STEIN: David knows he has to work harder at taking care of himself, but he's confident his dad's bionic pancreas will be ready in time. D. DAMIANO: My whole life I've just known - just had this knowledge that my dad is going to have this bionic pancreas out when I go to college. STEIN: Are you kind of figuring he's going to make it? D. DAMIANO: Yeah I'm confident in him. He works really hard - really hard. KOSTER: Maybe I'll bring you cookies. E. DAMIANO: Two-thirty in the morning. STEIN: By the end of the week, it's time for Ed to check in with Ariana and the other volunteers. KOSTER: I can already see how awesome it is. STEIN: For the first time in forever, Ariana's not obsessing over her blood sugar. She even snuck a cookie that night. KOSTER: Oh, it's amazing. It's going to change my life. STEIN: The next round of testing starts this afternoon. Ariana, and dozens of other volunteers around the country, including some kids at camp this summer, are trying it for even longer. 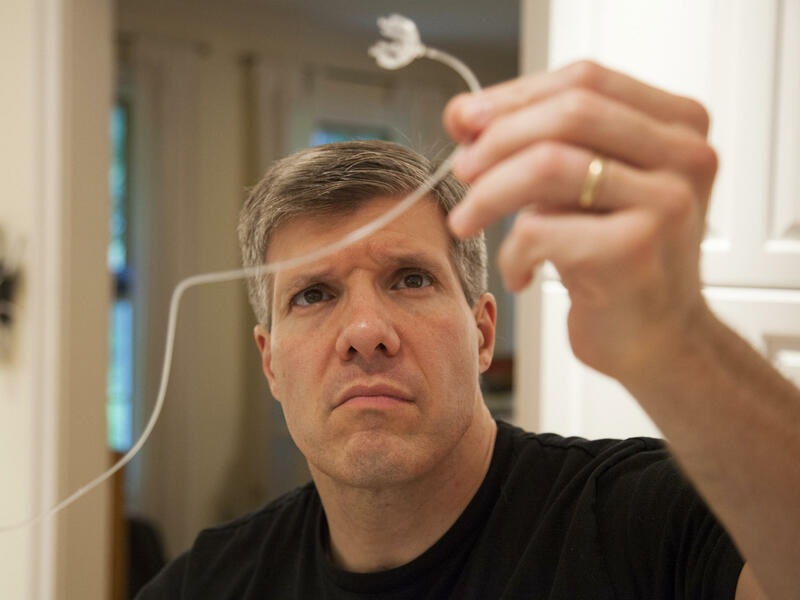 Ed hopes that will help prove his bionic pancreas works just in time for David's first night alone in his dorm room. Rob Stein, NPR News.